Pamela Chabora (Miriam), Hayley Hudson (Siena) and Tim Moore (Joren) tell stories of the Dutch Resistance during World War II in “Hidden” at the Pagosa Center for the Arts. Pagosa Springs High School actress Hayley Hudson (Siena) reminisces in a scene from the Thingamajig Theatre Co. production of “Hidden” at the Pagosa Center for the Arts. 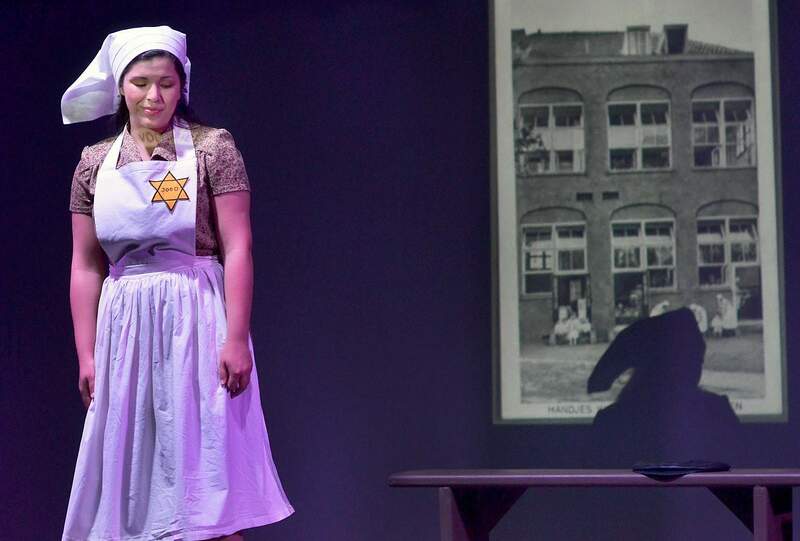 Hayley Hudson wears the uniform of a Dutch Jew in a scene from “Hidden” at the Pagosa Springs Center for the Arts. Projected images expand the set of “Hidden” for actors Tim Moore (Joren) and Hayley Hudson (Siena) at the Pagosa Springs Center for the Arts. 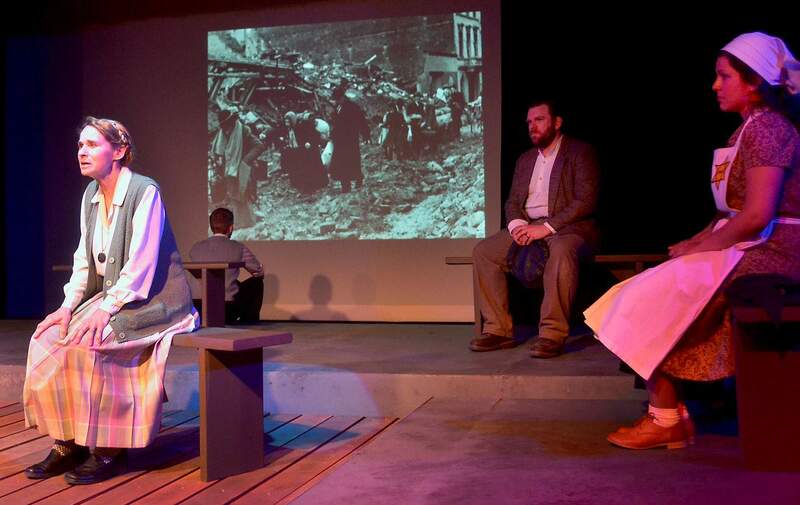 “Hidden: Stories From the Dutch Resistance,” this year’s opening offering at the Pagosa Springs Center for the Arts, is a delicate, yet blatant reminder of what human beings are capable of – for better or for worse. Set in occupied Holland during World War II, the latest production from the adventurous Thingamajig Theatre Co. asks the simple question: What would you do? “Hidden” follows the lives of seven Dutch men, women and children as they risk the lives of their own family to save the life of a Jew. 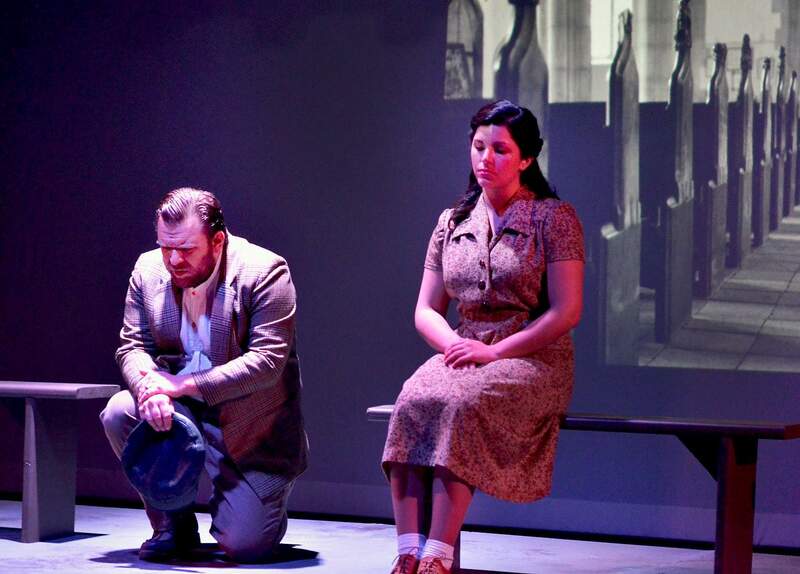 Where many theatrical and cinematic visitations to the Holocaust grimly depict the unimaginable horrors of the concentration camps, “Hidden” examines the internal, moral drama so many faced in circumstances few can comprehend today. In a setting where hope struggles to survive, the human spirit proves itself time and again. Written by Colorado playwrights Jamie Bruss and Christopher Willard, “Hidden” premiered in 2007 at the Backstage Theatre in Breckenridge. Bruss and Willard conducted extensive interviews with survivors and research to construct this beautifully written drama. Both writers sought to explore the experiences of survival and heroism. Director Laura Moore, who acted in the 2007 premiere, respectfully handles Willard’s and Bruss’ material with subtle direction. Moore also revives her role as Astrid, the wife of a Nazi doctor. The Pagosa Springs Center for the Arts continues to recruit talented local and out-of-town professional actors. Pamela Chabora and Wade P. Wood join the Pagosa Springs and Durango cast for this production. 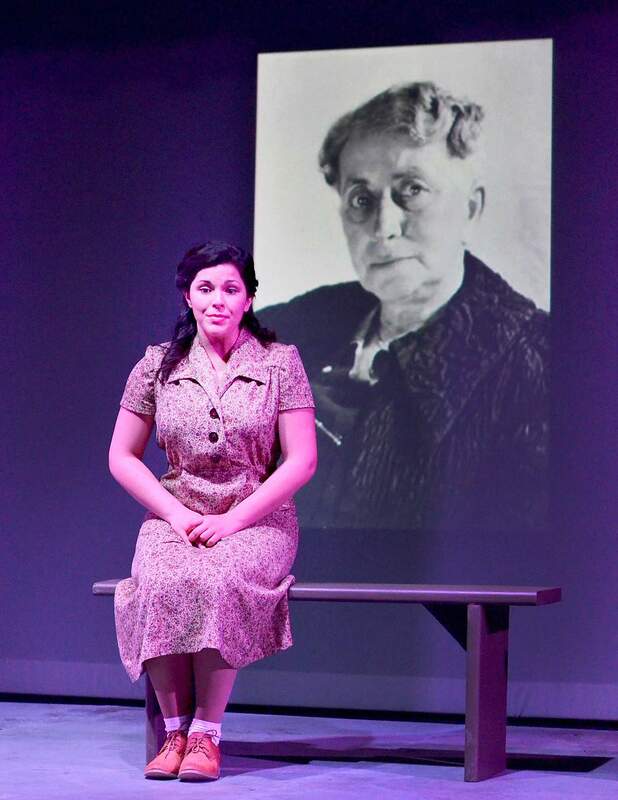 Chabora, a performance specialist and professional actor from Maine, portrays Miriam as a teenager during the occupation and as an old woman recounting her experiences. She tastefully finds humor even in the darkest moments. Wood, formerly the executive producer of the Denver Victorian Playhouse, is Piet, a schoolboy who becomes essential to the Dutch Resistance. Bearded and gray, Wood flawlessly brings to life the joy and fearlessness of a child. Local actors Bonnie Hite, Hayley Hudson (Pagosa Springs High School) and Kenneth Breece (Fort Lewis College), further prove the existence of hidden talent in Southwest Colorado. Tim Moore, artistic director of Thingamajig, rounds out the charismatic ensemble. As with many mountain theaters, the Center for the Arts will feature comedies and musicals for its summer season – “Spamalot,” “The Full Monty” and “Good People” are on the summer bill. Dramatic pieces such as “Hidden” are the company’s opportunity to experiment and take risks. With this performance, the risk paid off. “Hidden” begs us to not only remember the horrors but also the uplifting stories of goodness and survival. Because, as Willard and Bruss point out, humans must remember that we never learn from our mistakes. “Hidden” will run through May 26. Thingamajig Theatre Co. presents “Hidden: Stories from the Dutch Resistance,” by Jamie Bruss and Christopher Willard, directed by Laura Moore, at the Pagosa Springs Center for the Arts, 2313 Eagle Drive. Show times are 7 p.m. Fridays and Saturdays and 2 p.m. Sundays through May 26. Tickets cost $18 in advance/$25 at the door, available by phone at 731-7469 and online at www.pagosacenter.org.